The VSI reported two explosions at Peuet Sague on 25 December, and another the next day. The explosions deposited ash over a wide area including villages 20 km from the summit. As of about 8 January lava flows were visible at the volcano from Trans village, 7 km away. The volcano is at Alert Level 2 (on a scale of 1-4). Peuet Sague's 1999 activity (BGVN 24:05) was reported to have continued, although at a decreased level, through 14 June 1999. A malfunctioning seismograph prevented instrumental monitoring in late May, but thin white gas-and-steam plumes that rose ~15 m were visible. During the first week in June plumes continued to rise to heights of 20 m. Rumbling was heard on 18 occasions, and plumes continued to rise through 14 June. The VSI did not release further reports until renewed activity began at 0800 on 25 December 2000 with the first of three explosions. A second explosion occurred at 1310, and a third one followed at 1130 on 26 December. The explosions generated ash that spread over a relatively large area. Ashfall occurred on Geumpang, Lutung, Mane, and Bangke villages up to 20 km away. An observer from the village of Trans reported having seen glowing lava flows at night. Reported emissions ceased for the remainder of 2000, and the hazard status stayed at 2 (on a scale of 1-4). An eruption of Mount Peuet Sague, in a remote part of northern Sumatra, was first seen the morning of 26 April by pilots. Indonesia's Antara news agency reported on 27 April that a pilot of the national airline, Garuda, saw a volcano erupting in the province of Aceh, in the Pidie area. The report said the pilot saw ash to an altitude of ~3 km as he flew over at ~7 km altitude. The report also quoted the local Air Force chief as saying a fighter pilot spotted fire and thick smoke issuing from the mountain. It was the second recent eruption there: the first, on 19 April, was obscured by thick smoke from forest fires. Officials at the Ministry of Mines and Energy, which has responsibility for monitoring volcanic activity in Aceh Province, reported a phreatic eruption. The active crater is near Mount Tutung, 2 km W of the peak of Peuet Sague. The nearest village sits 8 km W of the eruption center. No one was harmed and it appears few noticed, as there were no accounts from local residents of sounds, tremors, or ashfall. There were some indications of material ejected from the crater. A 15 May statement said white smoke was weakly issuing from the volcano, but that all other activity had ceased. Peuet Sague is remote and scientific information is accordingly difficult to collect. VSI observers who went to the area shortly after the latest eruption were delayed because they had to walk nearly four days to reach the volcano. The Mount Peuet Sague Volcano Observatory was initiated at the end of 1997 but had been equipped with neither monitoring devices nor observers at the time of this activity. VSI planned to install one radio telemetric seismograph and to employ one observer by late May 1998. Background. The name Peuet Sague, which has numerous spelling variants (e.g. Peut Sagoe, Peuet Sagu, Puet Sagu, Peuet Sagoee), means "square." Accordingly, Peuet Sague, a stratovolcano, contains four summit peaks. It is located in Sigli Regency, Aceh Province near Seulawah Agam and Burni Telong volcanoes. The crater believed to be active resides SE of one of the peaks of the lava dome (Mount Tutung). This narrow crater has a diameter of about 70 m and a depth of 80 m.
According to Igan Sutawidjaja, a May 1920 expedition was stopped by heavy ashfall and a 1952 expedition spent 20 days without reaching the volcano. A 1975 team reached the peak after nine days but found no eruptive activity. They documented a lake (500 x 800 m) at the foot of Mount Tutung containing water at a temperature of 19°C. Within Tutung's crater they found a small (40 x 75 m) blue lake with a temperature of 21°C. This intracrater lake was surrounded by four solfataras (with temperatures of 59-78°C). The last major eruption occurred in 1918-21 when ash was emitted, a lava dome was formed, and pyroclastic flows spilled into surrounding uninhabited forests. Scientists inspecting the summit area in 1984 found burned trees surrounding the main crater, likely due to a 1979 eruption. Local eye-witnesses and pilots reported ash columns above the summit in 1979, 1986, and 1991. An expedition in 1984 found burned trees surrounding the crater, attributed to the 1979 eruption. Uncertain activity was reported in 1949. Information Contacts: Mahbub Iskandar, Ministry of Mines and Energy, Banda Aceh, Sumatra, Indonesia; Igan S. Sutawidjaja, Volcanological Survey of Indonesia (VSI), Jalan Diponegoro No.57, Bandung 40122, Indonesia (URL: http://www.vsi.esdm.go.id/); Reuters News Agency; Associated Press. During 9 March-24 May activity initially increased but later diminished. Volcanic activity increased during 9-15 March and people in the local settlement heard booming noises about 20 times/day. From 16 to 22 March, volcanic activity continued at the same scale, but the booming noises weakened. The seismic record also illustrated decreased intensity. Activity continued through the week of 23-29 March without diminishing, but the booming noises ceased. Volcanic and tectonic events increased, with volcanic type-B earthquakes rising from 6 to 15 and tectonic events increasing from 1 to 18. From 27 April to 3 May volcanic earthquakes increased and an eruption emitted white-gray ash to 200 m.
Activity began tapering during 4-10 May. A white plume was observed at heights of 10-20 m. Volcanic shocks decreased. Activity continued to decline during 11-17 May, with a plume ranging from 10 to 200 m heights. Volcanic activity was not recorded during 18-24 May, but observers reported 14 "thin white ash plumes" rising 10-50 m.
The Peuet Sague stratovolcano contains four summit peaks. 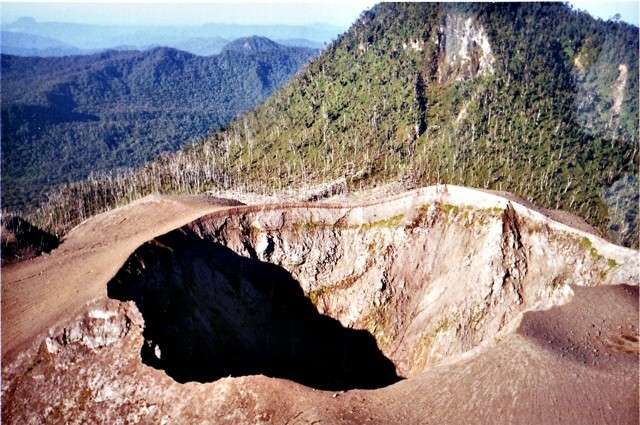 The crater believed to be active resides SE of one of the peaks of the lava dome (Mount Tutung). This narrow crater has a diameter of about 70 m and a depth of 80 m. The last major eruption occurred in 1918-21 when ash was emitted, a lava dome was formed, and pyroclastic flows spilled into surrounding uninhabited forests. A 1975 team that reached the peak found no eruptive activity, but documented a lake (500 x 800 m) at the foot of Mount Tutung. Within Tutung's crater they found a small (40 x 75 m) blue lake surrounded by four solfataras. Scientists inspecting the summit area in 1984 found burned trees surrounding the main crater, likely due to a 1979 eruption. Local eyewitnesses and pilots reported ash columns above the summit in 1979, 1986, and 1991. Peuet Sague is a large volcanic complex in NW Sumatra. The volcano, whose name means "square," contains four summit peaks, with the youngest lava dome being located to the N or NW. 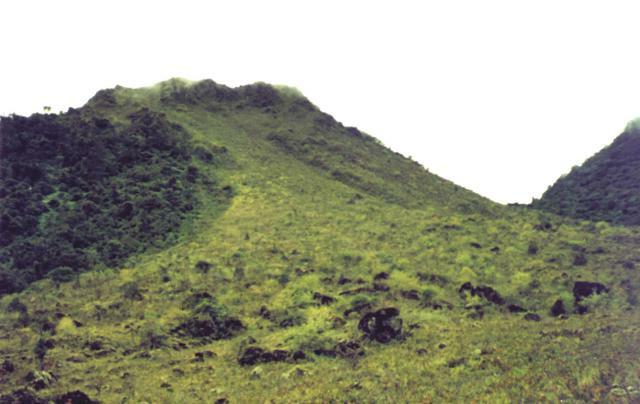 This extremely isolated volcano lies several days journey on foot from the nearest village and is infrequently visited. The first recorded historical eruption took place from 1918-21, when explosive activity and pyroclastic flows accompanied summit lava-dome growth. The historically active crater is located SE of the Gunung Tutung lava dome and has typically produced small-to-moderate explosive eruptions. There is no Deformation History data available for Peuet Sague. There is no Emissions History data available for Peuet Sague. Thin clouds drape one of four summit peaks of Peuet Sague volcano in NW Sumatra. This infrequently visited volcano lies several days' journey on foot from the nearest village. The first recorded historical eruption took place during 1918-21, when explosive activity and pyroclastic flows accompanied summit lava dome growth. 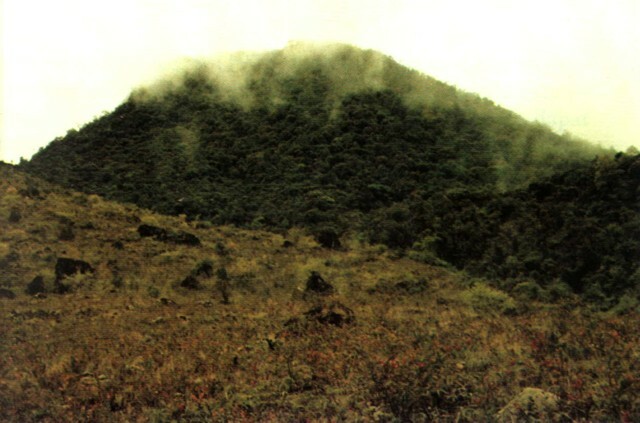 Photo by Sumarma Hamidi, 1975 (Volcanological Survey of Indonesia). Vegetation drapes one of the four peaks forming the summit of Peuet Sague volcano in NW Sumatra. This extremely isolated volcano lies several days' journey on foot from the nearest village and is infrequently visited. The first recorded historical eruption took place during 1918-21, when explosive activity and pyroclastic flows accompanied summit lava dome growth. Photo by R.D. Erfan (Volcanological Survey of Indonesia). The steep-walled summit crater of Peuet Sague is part of a large volcanic complex that rises to 2801 m in NW Sumatra. The volcano, whose name means "square," contains four summit peaks, with the youngest lava dome being located to the north or NW. The first recorded historical eruption took place from 1918-21, when explosive activity and pyroclastic flows accompanied summit lava-dome growth. The historically active crater has typically produced small-to-moderate explosive eruptions. Copyrighted photo by Michael Thirbeck, 1997. There are no samples for Peuet Sague in the Smithsonian's NMNH Department of Mineral Sciences Rock and Ore collection. Large Eruptions of Peuet Sague Information about large Quaternary eruptions (VEI >= 4) is cataloged in the Large Magnitude Explosive Volcanic Eruptions (LaMEVE) database of the Volcano Global Risk Identification and Analysis Project (VOGRIPA).